Cuisinart is one of the most famous names in the world of food processors. You don’t have to look too far to find someone who has been using a Cuisinart machine bought 20-plus years ago. It will still be going strong, and the customer will likely swear by it. Cuisinart dlc-2009chb prep 9 9-cup Food Processors are part of the brand’s current product line and come with many handy and modern features. But firstly, it looks good and it is compact enough to sit on any counter-top. The Cuisinart dlc-2009chb prep 9 comes in two sizes: 9 cup, or 11 cup. You will not have to cut up your fruit or vegetables before putting them into this food processor, as the feed tube is very wide. This is important, as using a food processor is about reducing the amount of time you spend prepping your ingredients. Cutting up your food to make it small enough to fit inside the unit is wasting time. The large feed tube is great when you are using uncut foods, but sometimes you need more finesse. That is not a problem either, as there is a pusher with a small opening for holding long vegetables or adding liquids. This was the most common comment made by people who have reviewed the Cuisinart DLC-2009CHB Prep 9. Over 30 percent praised how easy it is to clean. It has movable parts, including a shredding disc, slicing disc, chopping blade and dough blade. All of these parts can be washed by hand, or they can be placed in the dishwasher. Also, the Lexan 9-cup or 11-cup work bowl is virtually shatterproof so should survive the normal bumps and falls of a family kitchen. Custom, one-piece, large feed tube. that can handle whole fruits and vegetables. 4mm stainless steel slicing disc. Instruction booklet that contains recipes. 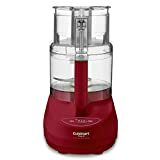 For more information on the features and specifications of Cuisinart Prep Plus Food Processors visit Amazon.com. At the time of writing this, there were 944 reviews of the Cuisinart DLC-2009CHB Prep 9 9-cup Food Processor. Of these, 415 gave it the top rating of 5 out of 5 stars. The average was 4.6 out of 5 stars. Most of the reviewers liked how easy it is to clean as well as the compact design and the large feed tube. There were some criticisms, however. Some said changing the blades is a process that is more difficult than it should be, while others said it can spill when it is being run close to its capacity of 9 or 11 cups. The overwhelming majority of the reviews were positive, however. You can read more reviews about food processors on Amazon.com. The Cuisinart DLC-2009CHB Prep 9 9-cup Food Processor gets excellent reviews and ratings. It has some handy features, like the wide feed tube, and it has been designed to fit nicely into the décor of a busy family home. It sells for about $131.99, which is a great price for an appliance of this quality and with this many features. It comes with all of the accessories you will need to make the time you spend in the kitchen more efficient.